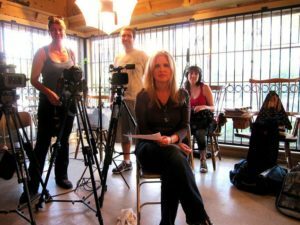 Pink Mermaid Productions is a Los Angeles based boutique production company founded by producer/director Regina Banali to develop films and television. Early projects included PSAs and a comedy short for Sony’s Crackle platform, and in 2010, Pink Mermaid began production on its first feature-length film, a documentary on the band Quiet Riot. An early pioneer of crowdfunding, she raised the seed money on Kickstarter in the summer of 2010, long before crowdfunding was a common funding strategy. The film “QUIET RIOT: Well Now You’re Here, There’s No Way Back” was in competition at the 2014 Newport Beach Film Festival and won the Festival Honors Award for “Best Music Film.” It was quickly acquired by the Showtime Network for a two-year license and premiered there on Jan 29th 2015. Like many of Hollywood’s best directors, Banali began her career in front of the camera, appearing in over 50 film and television roles over two decades earning her chops on both ultra low budget movies and blockbusters. One of her first acting roles was as a mermaid in Steven Spielberg’s “Hook”. She had the great fortune of being on film sets and learning the craft of filmmaking from legendary producers and directors. She worked with, shadowed or was mentored by filmmakers such as Mr. Spielberg, Francis Coppola, Renny Harlin, Anthony Andrews, L.Q. Jones and J.F. Lawton. She credits the mentorship of great talents as both an inspiration and a foundation as a storyteller. Pink Mermaid productions employs a roster of talented DPs, editors, and a solid network of talent in every department. We have produced content for buyers such as Showtime Network, Crackle, The Humane Society of The United States, Frontiers Music and distributed on network television, theatrical release, iTunes, Amazon Instant video, and DVD worldwide. We are currently developing film and television projects in both narrative and documentary genres and music videos. Regina is President and CEO of Intimacy Coordinators Alliance for Film and Television. ICAFT trains and certifies Intimacy Coordinators who are industry veterans with the experience, training, and passion for protecting artists on set that is essential to do this sensitive work and are committed to following the protocol established by the founders.